In 2018, the City will have invested more than $720 million to maintain and upgrade its infrastructure in the public right of way. An estimated $360 million was earmarked for roads, expressways, bridges (including rehabilitation of the F. G. Gardiner Expressway); $300 million on sewers and water mains; and $60 million on basement flooding protection. While these investments help address the City’s significant infrastructure renewal backlog and provide longer-term benefits, construction activities will have some adverse impacts on traffic, road users, residents, and businesses in the short term. The Major Capital Infrastructure Coordination Final Review of Scope and Timing (FROST) process for the 2021 capital works program is underway. City staff have posted all planned capital works projects for 2019 on the T.O.INview map. The map, searchable by year, location and type of infrastructure work planned for the City’s right of way can be found at www.toronto.ca/inview. A list of major capital projects (valued at $10 million or more) being delivered by the City in 2018 is provided at the end of this note. To ensure that capital projects on the public right of way are completed with the least amount of public disruption the City has developed a multi-year process of capital coordination led by the Major Capital Infrastructure Coordination (MCIC) Office. The figure below illustrates the process which begins at least five years before shovels hit the ground, starting with an assessment of needs by the asset owners including Toronto Water, Transportation Services, TTC, and Toronto Hydro. The next step involves prioritizing and aligning infrastructure needs among the City’s divisions and agencies. Three years before construction, councillors have an opportunity, along with other stakeholders to review the planned work, and the City infrastructure interests are then aligned with third party (e.g., utilities) interests. This opportunity for councillors to provide input and raise issues and concerns about upcoming construction during the FROST process. Raising issues during FROST enables City staff to mitigate planned construction issues and meet the planning timelines. This coordination bundles the work of different groups together into a single construction project. For example, bundling water main and sewer replacements with road and sidewalk reconstruction helps avoid multiple disruptions on the same street provided that the water main or sewer is in need of repair or replacing. It also mitigates damage to newly paved streets by sequencing the replacement of underground infrastructure before roadwork. City staff review special events (e.g., Toronto International Film Festival) to make sure they are well coordinated with planned capital projects so that disruptions to the public are minimized. 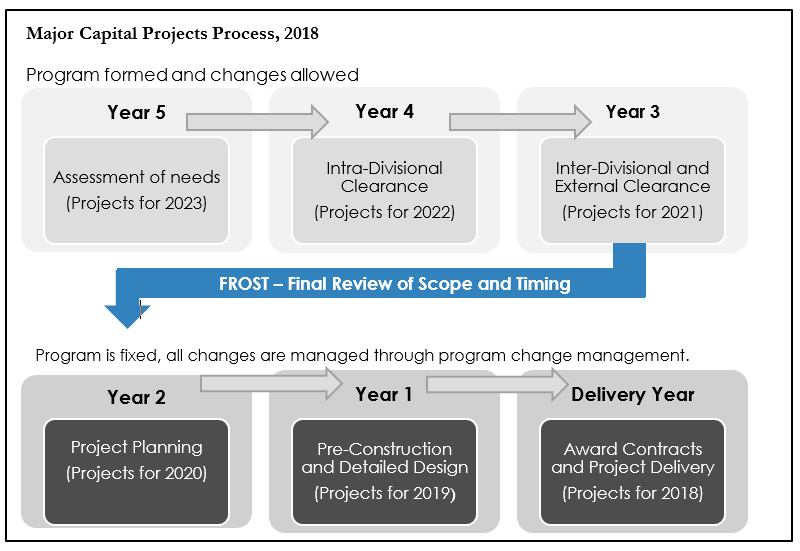 Two years before construction, the Final Review of Scope and Timing (FROST) takes place, and the capital program is fixed. All organizations with projects planned for the public right of way begin designing projects. Engineering design drawings are completed in the following year, and tendering, awarding and commencing construction the subsequent year (i.e. the year of construction). The multi-year capital coordination process relies on all organizations sharing their capital plans and being disciplined in adhering to the coordinated program to ensure capital projects can proceed as planned and disruptions to the public are minimized. Some challenges arise each year due to changing priorities late in the coordination process, and unforeseen circumstances that result in adding or deferring specific projects or changing project scope. Even when the process runs smoothly and results in efficient capital planning and construction, there are numerous stakeholders in every project. Area residents, local businesses and councillors who can raise important issues related to individual projects near the time of contract award, or even during construction, which can lead to delays in project delivery. These situations pose coordination challenges for the City’s in-house municipal infrastructure capital delivery agent, Engineering & Construction Services, Toronto Water, and Transportation Services. For all City-led construction in the public right of way, City staff work to mitigate the impacts of construction on traffic. Mitigation strategies may include extended, overnight or 24/7 work hours on some construction projects to shorten the duration of work. Proposals for accelerating work schedules are discussed with the local councillor before implementation. Other approaches to minimizing disruption include changing signal-timing on parallel roads and limiting short-term work (e.g., routine maintenance) on nearby roads. Informing residents and business owners about planned capital projects is important in the construction delivery process. City staff provide information through consultation meetings and information pop-ups; pre-construction and construction notices delivered by Canada Post, door-to-door, and posted on toronto.ca/improvements; construction updates; news releases; tweets and social media updates when appropriate; on-site signage and programmable, portable message signs. Rehabilitation of the Rosehill Reservoir – contract valued at $35 Million over 4 years. Site Preparation for the Integrated Pumping Station (Construction Contract 1) at the Ashbridges Bay Treatment Plant Contract awarded in 2018 at a value of almost $24 million, and expected to be completed by 2019.